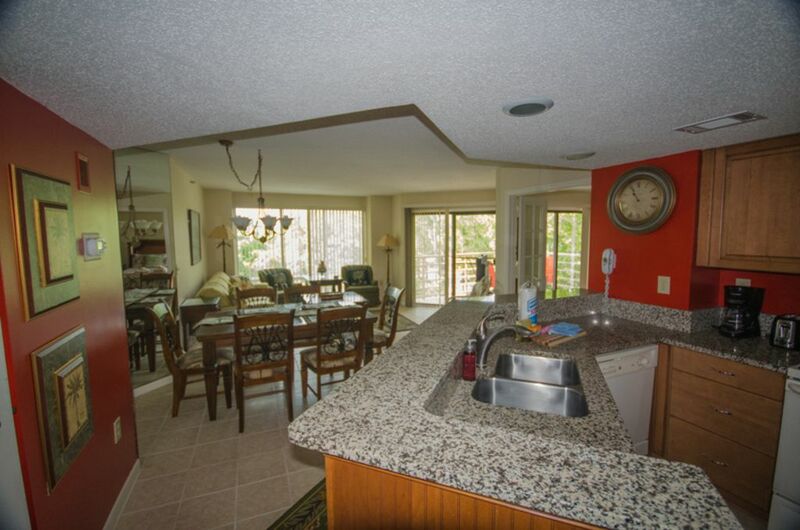 Stay in our condo in beautiful Palmetto Dunes!! Just steps from pool and beach! ENJOY your time on Hilton Head Island by staying in our beautifully updated and comfortable condo located in the oceanfront Villamare complex of Palmetto Dunes, where the beach is less than 200 ft away!! NO streets to cross-just an easy walk out the door, down the hall, down 2 levels via the elevator or stairway, through the beautifully landscaped lagoon and pool area, across the short boardwalk and you are there!! We also own 3226 Villamare, next door, AND 3224 Villamare (Oceanview), down the hall, for those of you traveling with others and needing another condo or two! OCEANFRONT PALMETTO DUNES ON HILTON HEAD ISLAND, SC. WE OWN THREE 2BR VILLAMARE CONDOS LOCATED ON THE SAME FLOOR! RENT 1, 2, OR ALL 3!!! NO KEYS ARE NEEDED WITH OUR KEYLESS ENTRY SYSTEM! The entry code is changed with each renter. Feel more secure knowing you have your own unique entry code assigned only by the owner! Villamare has it's own private HEALTH CLUB with an indoor pool, sauna, and hot-tub, as well as exercise equipment and free weights. As our condo guests, THIS IS ALL FREE OF CHARGE TO YOU! Villamare is situated on the finest beach on Hilton Head Island, within walking distance to more amenities than any other villa area. Located through the private gates of Palmetto Dunes between the Marriott Beach and Golf Resort and the Hilton Oceanfront Resort, you can walk to the world-renowned Palmetto Dunes Tennis Center, The Robert Trent Jones Golf Course, The Fazio Golf Course, The Arthur Hills Course, The General Store, Palmetto Dunes Outfitters (bike, canoe, & crib rentals), and several wonderful restaurants. You can literally park your car and never leave! RIDE THE FREE SHUTTLE SERVICE provided by the 'Palmetto Dunes Buggy' with regular stops at Shelter Cove Plaza, Mall and Harbor, The Plantation Center, Dunes House & Palmetto Dunes Tennis Center. Seasonal only. Our 3227 Villamare is located on the second floor of bldg.#3, accessible by two elevators or three sets of stairs. Either of these take you down to the pool and out to the beach. WHILE OUR CONDO DOES NOT HAVE A VIEW OF THE OCEAN, it's an easy 200 ft. stroll to the real thing! Compare our prices with an ocean view condo and you'll see a savings of $200-$500 per week! WHY NOT SPEND LESS AND ENJOY THE VIEW FROM THE BEACH ITSELF? OR FROM THE BEACH FRONT POOL DECK? Compare our discounted owner rates and quality and save money! We are Linda & Leigh and we have owned and personally managed this condo since 2004. It is very important to us to maintain our condo in a clean, comfortable, updated condition, and we make frequent visits to oversee the care of it. We take pride in the fact that we have many renters who return year after year! We have a local cleaning company and other service people that handle issues that may arise in a quick and efficient manner. The Villamare complex, located in the lovely Palmetto Dunes Plantation of Hilton Head Island has everything to offer! It is located mid-island which makes it convenient to get around on Hilton Head Island. The on-site Health Club, indoor & outdoor pools, perfectly landscaped grounds, and beachfront location make it a wonderful place to vacation. --2 spacious bedrooms with their own bathrooms and balcony. --a comfortable common area with dining table, full service kitchen with new stainless/black appliances, full sized washer and dryer, and a living room area with couch, 2 chairs, and a 48" flat screen TV on the wall. -Beautiful tiled floors through-out the condo with a few small accent rugs. Master Bathroom has large soaking tub, double sink vanity, and a beautiful tiled walk-in shower. The second Bathroom has a shower/bathtub combination, with granite single sink/vanity. Parking garage under the building as well as outside spots for larger vehicles. Bath and hand towels provided. Beach towels not provided. Villamare has it's OWN Health Club free to use by renters. It has an indoor pool, hot tub, sauna, and a separate work out area with free weights, ellipticals, treadmills, bikes, and a universal gym. Couch with pull-out sofa bed. 37' Flat screen TV with cable and DVD. Well stocked kitchen with custom cabinets and granite countertops. Large table with seating for 8-10 with counter top and stools. Beautifully landscaped gardens and lagoon area at Villamare. A main balcony accessible from the living room and master bedroom. Another private balcony off the 2nd bedroom. Rent a kayak or canoe at Palmetto Dunes Outfitters, 5 mins from the condo. Many miles of paved bike paths all over Hilton Head Island. Easy bike rental with discount from Riding Tigers Bike Rentals. Poolside decks and a quiet deck overlooking the ocean and beautiful landscaping. Play at the World Class Palmetto Dunes Tennis Center. Guests welcome for a discounted court time fee. Book through Palmetto Dunes. 3 Golf course in Palmetto Dunes: Arthur Hill, Trent Jones, and Tom Fazio. Ask for guest discount. Many other courses on and off island. Indoor at the Villamare Health Club and outdoors by the pool. For Villamare guests only. Coffee maker, Coffee Bean grinder, Blender, Mixer, Crock Pot, Cooking & Baking Utensils provided, Oceanfront outdoor Pool, Covered Parking under the building, Health Club with indoor pool, & hot tub. Extremely convenient location. Good owners, responsive and responsible. If you are a planning to cook some meals, need to bring supplies with you. There is plenty of dinnerware, pots, but no cooking supplies. Could use a few more sharp knives also, but these are small things. Would definitely stay here again. Many thanks to Linda and Leigh. Close to the pool and enough space for all. Loved the separate balconies and large 2nd bedroom with plenty of space for the kids. They even had their own bathroom. Had no problem with the fact that it was not an ocean view. This condo was a great deal because of it. The only recommendations would be for more paper products...toilet paper, paper towels, and napkins. If you plan on cooking a lot in the condo, you will need to pack basics like oil, spices, sugar, etc. The Owner was very responsive when we couldn't find something and brought it over since she was in the area. Would stay here again. We stayed at the property for 5 nites. My daughter and her fiancé stayed as well across the way, same property different unit. Just being honest, theirs was updated, beautifully furnished, and had a great view of lake and ocean in the distance. I would try to get that unit. Our first time in Hilton head, we would definitely go back. It is a beautiful vacation spot. The unit is in a great location , very clean, updated and close to the beach. The porch located on the back side of the building gets a lot of sun. Villamare is our favorite location to stay on Hilton Head Island..
We had a wonderful time. This property is lovely, well appointed and comfortable. Very nice location to activities. Linda Thomas made things very easy and she is a very nice and accommodating host. We will definitely come back to Hilton Head and will stay with Linda because this vacation spot met and exceeded our expectations. Go fishing, canoeing, or kayaking in the 11 mile lagoon system in Palmetto Dunes. Also, enjoy the many miles of paved trails for walking or biking. Palmetto Dunes is located mid-island, making all the other areas of Hilton Head Island very accessible. Refunds are given when cancelling 60+ days from arrival. Otherwise, refunds may be given at the owner's discretion. All renters are strongly urged to obtain travel insurance at their own cost. It is very affordable. Check with the owner for information.